As do many of you, I live in the Zenith City. It is the site of my home, my children's schools and my neighborhood. It is the remarkable place with which I identify. It is also the place of the precinct where I vote and where I have an opportunity to be an active participant in the political process. For many of the citizens of Duluth, it is also the place in which their businesses are located. Decisions made in City Hall, the County Court House, and the Historic Old Central High School Administration Offices impact us every day. Decisions related to taxation, local fees, zoning, and utilities can have a dramatic, compounding impact on individuals who are both home and business owners. The stakes are doubly high. The importance of being an active participant in the political process is understandably heightened for our neighbors who are fortunate enough to be both home and business owners. Recognizing this, it is a time to pay close attention to the upcoming local elections. Ideally, it is time to fully engage in the political process. This includes considering the merits of placing your good name for consideration as an elected leader. If you own property in our Shining City on the Hill, congratulations. You own a piece of Heaven. You would be wise to support - financially and otherwise - the election of individuals who advocate for our community's property owners. It is also an ideal time to better understand the positions of local candidates, familiarize ourselves with the voting records of area representatives, and to inform our elected officials of our views on local issues. Duluth's primary elections are just eight months away. Six of our nine city council seats are up for election. In September, we will also vote to determine who the two final candidates will be for Mayor of Duluth. We are fast approaching what could be a transformational change within City Hall. Are we ready? Are we informed? 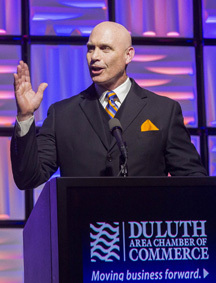 Be assured, the Duluth Area Chamber of Commerce's leadership is identifying issues important to our members. We will be communicating our views on these issues to candidates who are hoping to be elected to local leadership positions in November. Our collective voice will be heard in the halls of government. We will be emphasizing to these candidates that a strong business community strengthens the larger community. Together, we will soon elect leaders who will determine the level of police and fire protection we experience in Duluth. Incoming elected officials will determine how many of our community's children will be in a public school classroom. They will decide how many miles of city streets will be replaced and repaired. Voters will decide who will have the honor and the responsibility of making these decisions. It is time to engage in the political process. Candidates are announcing their intentions to seek elected office. They are formulating their positions on local issues. They are asking for our support. Engage. Give. Articulate. Benefit.